d’Optron, a startup that uses artificial intelligence and image visioning to improve quality control processes, won the She Loves Tech pitching competition in Singapore last night. She Loves Tech is a global organisation focussed on promoting women in the technology industry. The company has a conference series as well as the competition around the world. For winning, d’Optron will receive an all-expenses paid trip for two to Beijing which will also include an opportunity to meet mentors, business leaders and the local ecosystem. d’Ooptron will also compete against 14 other startups from across the world with the chance of becoming the global Grand Champion. Finally, they will have an opportunity to speak at a Women in Tech conference. “I feel very energised, I am very inspired by these people who are stepping up and strengthening the ecosystem. 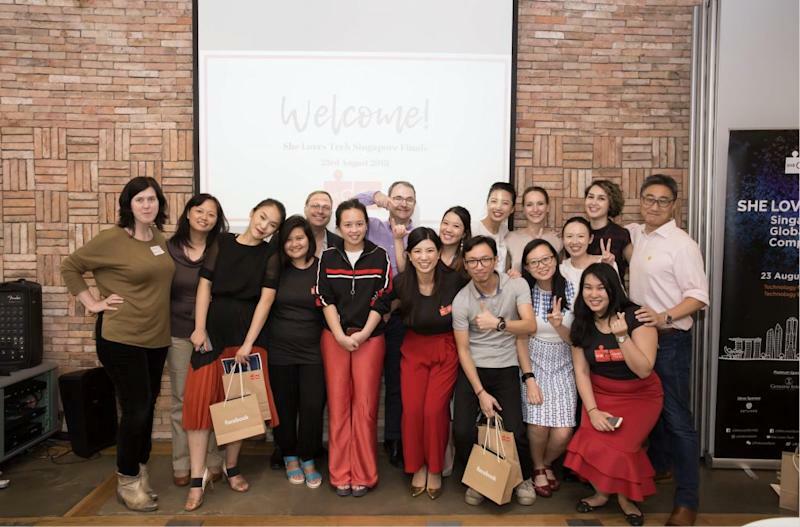 When I speak to female entrepreneurs, they always say, ‘I am so alone in this, I don’t have other women in tech that are in my network,'” Leanne Robers, Head of Singapore for She Loves Tech, told e27. “Being in She Loves Tech has proven this wrong to me, there are so many women in tech and women impact startups really taking a stage both in Singapore in Southeast Asia and globally,” she added. The key takeaway from the She Loves Tech event was the high quality of companies pitching. e27 attends a lot of pitching competitions and even runs its own event with the TOP100 programme. She Loves Tech will be one of the best pitching groups of 2018. The companies on stage yesterday were one of the highest quality groups of startups pitching all year. Every single company was solid and while winning is nice, their businesses appeared solid enough to not be overly impacted by the results of last night. So, with that being said, let’s meet the companies! This startup is tackling the surveillance camera industry by building a tool to make big data and video analyse more accessible. AIMLedge has built a platform that creates, optimises and deploys deep learning software for any commodity camera. They claim it reduces the time and cost to go to market by 80 per cent. It can be used to reduce manufacturing costs for businesses or bandwidth costs for security purposes. Backed by EnterpriseSG, the company makes money per device that uses the software. CarePod wants to bring first class safety to pet air travel. They sell their top-of-the-line carrier to airlines who then can either white label the product or rent it out as a value add service. The IoT Pod allows people to monitor their pets, control temperature fluctuations, and it includes a water tank and safety features. It is first class doggy travel. Dipp is a marketing agency that has built a tool that allows companies to design social media campaigns in minutes. The algorithm analyses a customer’s preferences and then designs a visual that fits their demographics. It also has many variations to prevent advertising fatigue and they are working to integrate with Google Adwords. The company targets SMEs who do not have a gigantic budget to spend on digital marketing. It is pursuing a freemium business model with a monthly subscription. The startup was launched in February 2018. The She Loves Tech winner uses smart 3D vision along with AI, to allow manufacturers to detect defects in their product. d’Optron calls the technology Smart Depth Profilemetry and claim it is faster, more efficient and cheaper. They say they stand apart from the competition because it does not need to be deployed in hyper-regulated rooms, but rather can be used on a loud, chaotic, manufacturing floor. Currently, they are targetting smart devices, semiconductors and hardware. They sell a piece of hardware and have software services attached. Fractal Blockchain wants to help companies raising an ICO meet their regulatory requirements. Launched in September 2017, the startup is based in Berlin with a physical presence in Porto, Portugal and Singapore. However, it says it is not restricted to these countries and can help ICOs perform their KYC checks in 150 jurisdictions. For ICOs, companies have to deal with the regulations from wherever the investor is coming from, which could mean dozens of different laws. Fractal wants to make that process easier for startups. They make money by taking a percentage of the funds raised. Lily, a company that pitched at Echelon, is an AI-powered personal health assistant for women. In Southeast Asia, many women feel afraid of asking questions about their personal health. Lily can help by monitoring and tracking health data both manually and automatically as well as providing an avenue to ask questions and get answers immediately. It charges US$1 for a 10 minute consultation. The startup pitches itself as being particularly helpful during the pregnancy journey. They are raising US$500,000 to expand the team, scale their business and expand into new markets. Limitless is a company helps millennials save and invest their money. The problem is that, the difficult decisions of where to put money can be put-off for months, which means not enough money has been saved later in life. The solution is a white label app for banks that helps their customers pick short-term goals while still putting away money for long term retirement. The idea is that the short-term tangible rewards helps build a savings habit that will improve the long-term results. Musiio is an artificial intelligence for the music industry that wants to help producers find the next great hit. Now we can record music instantly. Currently, tens of thousands of songs are uploaded to services like Soundcloud and Spotify every day, so finding decent music is like searching for a needle in a haystack. The technology takes the audio file, turns it into a mathematical visualisation, extracts the features, runs it through neural networks and then pushes it onto a platform. The goal is that it helps producers filter out the terrible music and highlights the songs of decent quality. A medical technology company, See-Mode helps doctors and hospitals predict the next stroke. Strokes are caused by plaque blocking blood circulation to the brain, and See-Mode has developed a way to “see” when its more likely for one person versus another. Plus, it does not require additional tests and can be integrated into MRIs, CT scans and ultrasounds. It is piloting its project in Singapore, Europe and the US. The company has closed a seed round of financing. The post Hi-tech quality control startup wins She Loves Tech Singapore pitch appeared first on e27.